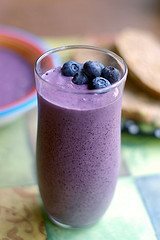 Get some “purple power” with this quick and easy recipe. You’ll get your daily dose of fruit in a delicious drink that packs a nice antioxidant punch, provides a good amount of dietary fiber, and plenty of essential nutrients and minerals. Trust me, your body and taste buds will thank you. This smoothie is good anytime of day, and can even be served as a healthy dessert. I prefer to use frozen blueberries and fresh pineapple for this recipe, but please prepare in whichever way suits your fancy. Enjoy! Place all of the ingredients into your high speed blender and blend on high for about 30-45 seconds until desired consistency is reached. If you try this smoothie please leave a comment below and reveal how “purple power” treated you. Happy Blending! I had this smoothie this morning with the spinach add-on and it was great! Would have never thought to throw spinach in. Lois (18 months) loved it too! Enjoying this smoothie right now. Added in some kale a 1tbps of hemp hearts for the extra boost. Delicious! Excellent! Thanks for sharing, Milissa. Easiest breakfast for my kids. I made if with spinach and chia seed add ins. It is very, very good. Glad you liked it, Jane!